Known for its emerald green color, matcha tea doesn’t just taste good steeped in heavy cream or almond milk — it’s also good for you. And when you make it keto, matcha lattes are even better. These creamy lattes seem to be all the rage these days. Just scroll through your Facebook or Instagram feed and you’ll likely notice one green tea latte after another. 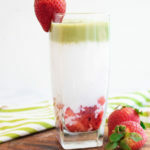 This strawberry matcha latte takes it up a notch with muddled strawberries for an extra boost of antioxidants and flavor — all without the sugary strawberry sauce you’ll find in most flavored lattes. Plus — this tea latte is low-sugar and full of health-promoting ingredients like MCTs, strawberries, coconut milk, and of course matcha powder. With heart disease accounting for one in every four deaths in the United States every year, maintaining a heart-healthy diet should be top of mind for everyone[*]. Berries contain some fantastic health benefits, usually related to their phytonutrient compounds. But strawberries, in particular, seem to have a beneficial effect on heart health. Strawberries are recognized for many active constituents including anthocyanins, catechins, ellagic acid, and quercetin[*]. Monk fruit, a sweetener used to replace sugar, is another ingredient in this matcha powder strawberry latte that may benefit your heart. In one study, mice were given monk fruit to determine the effect it would have on their cholesterol. The researchers found that monk fruit had a protective effect on LDL cholesterol. Likely due to its antioxidant activity, monk fruit was able to protect LDL from oxidation[*]. The oxidation of LDL is one of the markers of heart disease and can predict the likelihood of a heart attack[*]. Your liver is one of the largest organs in your body and is responsible for a host of different metabolic functions. It converts nutrients from food into usable forms by your body, stores them, and supplies them when necessary[*]. Keeping your liver in good shape is essential to your overall health. One study on matcha green tea looked at the protective potential of matcha powder in rats with type 2 diabetes. AGEs are formed when proteins or lipids are exposed to glucose. They’ve been correlated with aging and degenerative diseases like diabetes and Alzheimer’s[*]. Another study looked at the effect of green tea extract on liver enzymes in people with NAFLD (non-alcoholic fatty liver disease). After 90 days, participants that took the green tea extract showed significant decreases in both ALT and AST liver enzymes[*], markers of liver health. If you want to boost your cognitive function, add some matcha to your daily routine. This powdered green tea is packed with brain-supportive nutrients like l-theanine, epigallocatechin gallate (EGCG), and caffeine. One study even found that consuming matcha green tea can enhance memory and improve attention[*]. Strawberries are another brain food worth mentioning. As is true for most berries, strawberries are a wonderful source of flavonoids, specifically anthocyanins — which give them their beautiful red color. Anthocyanins are potent antioxidants, and experimental studies have shown that they may improve cognitive decline. In the Nurses’ Health Study, researchers measured rates of cognitive decline for six years in over 16,000 participants. The researchers found that higher berry intake was directly related to a decrease in cognitive decline. It was estimated that berry intake delayed cognitive aging by 2.5 years[*]. Looking for a little afternoon pick me up? This iced matcha is an excellent option for a Summer afternoon, or make it your new morning pick-me-up. Want it hot? Mix a scoop of matcha tea powder into boiling hot water or milk. Or — for a simpler iced latte — you can add a scoop of green tea powder and heavy cream to a blender, mix, and serve over ice for an even simpler iced matcha — and it tastes just like ice cream. However, you take your iced tea latte, the MCTs, berries, and high-quality matcha powder in this recipe are sure to wake you up and keep you going for hours. Add strawberries to the bottom of two tall glasses. Mash berries well with the back of a spoon. Mix heavy cream and milk together in a shaker cup or blender. Divide and pour ½ of mixture into each glass over mashed strawberries. Add Perfect Keto Matcha MCT oil powder into remaining milk/cream mixture. Shake or blend until smooth and powder has completely dissolved. Divide and pour mixture into glasses over milk/cream mixture. Stir to serve and add ice if desired.